Considering that the next 10 days has a forecast of 102 degrees each day, we decided that the waterpark sounded pretty good. 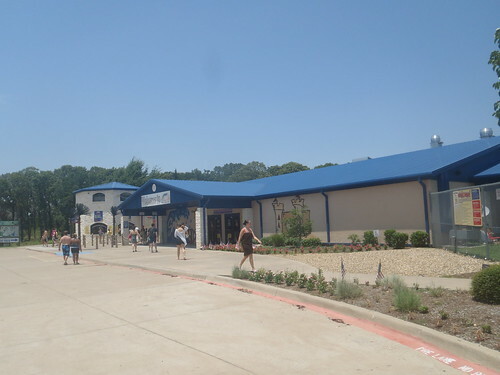 The closest waterpark to Lake Fork is Splash Kingdom in Canton, Texas, which is about a 45 minute drive. 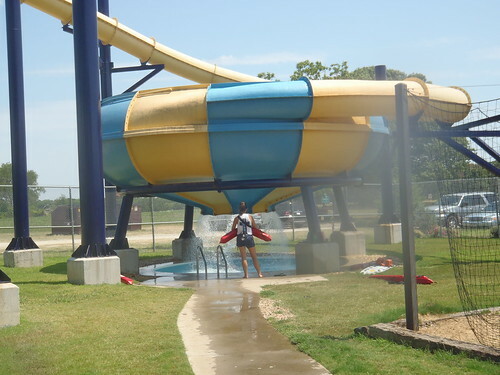 It’s also the only waterpark between Shreveport and Dallas and also serves Tyler to the South. 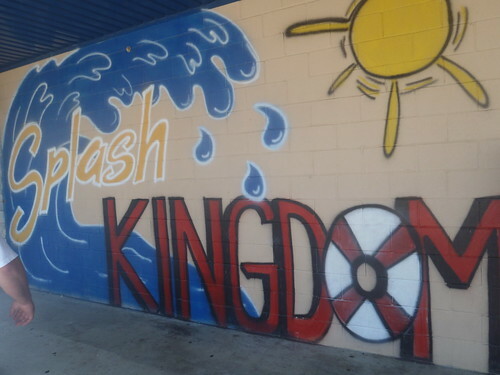 Overall, we really enjoyed the day at Splash Kingdom. The kid area was great with several fun slides, water that’s just deep enough to keep little kids and their parents cool as well as many fun sprayers and opportunities to get soaked. The raining mushrooms and the bucket that suddenly dumps water on you were among the favorites of the day. Our son also really liked the whale slide. It was pretty laid back, but just his size. The larger slides were also quite popular amongst the adults and teenagers. The Royal Flush was a disorienting slide that suddenly flushed you into a 7 foot pool. The white (White Lightening) and blue (Blue Thunder) slides were twisting tube slides and the pink slide (Pink Panic) twisted with a sudden drop. Thrill seekers would enjoy the steep yellow slide (The Express) that is a simple steep drop. The Lazy River was pretty lazy, but a nice ride through the park that you could float or swim. It was a good opportunity to take a break and chat a bit. 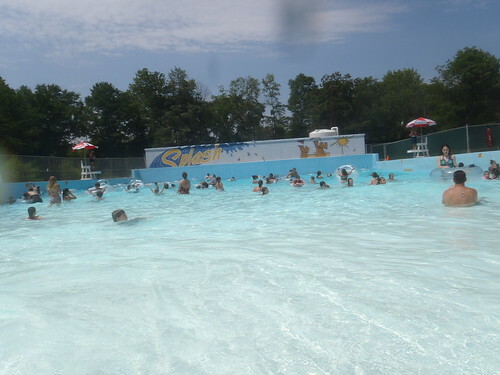 The Wave Pool was definitely a crowd pleaser as well. Between the waves, it’s a good place to just swim around and chill out in. When the waves come, be prepared because they’re stronger than you would think, especially the closer you get to the “shore.” Our little guy had a lot of fun in this pool as well because what little kid doesn’t love to be consistently splashed in the face? Other areas in the park which we did not have the opportunity to explore were the glow-in-the-dark putt-putt golf, arcade and the restaurant. There are two concession stands that sell ice cream, drinks and pizza in the park in addition to the restaurant. We also did not make it into the gift shop. Concession stand prices were rather high, but typical for most waterparks. Because they don’t allow you to bring in food and drinks, they do have picnic areas outside and you are allowed to come and go throughout the day as you please by getting a hand stamp. Despite all of the fun that we did have today, there were a few areas that we weren’t too sure about. The cost for adults is $20.94. Under 42 inch kids get in for $16.95, as do 65+ seniors. Kids 2 and under are free. This seemed a bit steep to us, considering that Splash Kingdom isn’t an overly large park. The park does seem to be just about the right size, as it’s not too big that you lose your party easily, but we didn’t feel it was quite worth the cost. The cost to rent a locker was also rather steep. Small lockers were $5 plus $5 deposit for the key. Large lockers were $7 plus $5 deposit for the key. We got a large locker and it wasn’t really that large especially considering that you could get an Amtrak locker in a busy city for $3 and be able to fit a whole suitcase in it. The final issue that we had is that the security guard carries an actual gun. We couldn’t quite understand why he would need a gun at a family-friendly and openly Christian water park that plays Christian music over the speakers and has quotes from the Bible on the signs. The majority of the customers at the water park are children, many of which are very young. After discussing the fact that the security guard carries a gun with the manager, we learned that they have occasional occurrences in which the gun was needed and that is not actually loaded and the clip has to be put in for it to be used. However, what I don’t understand is why they need a gun and could not have pepper spray or a Tazer gun instead – something that is not lethal. As a mother to a young boy, I try to keep guns out of sight and out of mind, so it doesn’t help that the security guard at the waterpark is wearing one on his belt. This also prompted a few questions from us as well. The park does check your bags upon entering and it is clear that they are checking for food, beverages and tobacco products, as the park is non-smoking, but it’s obvious that their main concern is food and drinks. So, if they already check your bags, could they not just have metal detectors to check for weapons as well? This would eliminate the need for an armed security guard – no? The fact that the manager acted like it wasn’t that big of a deal when we asked about it turned our feelings about the park a bit sour. If an occasion arose in which the security guard needed it, would they actually use it and shoot somebody in front of all of the children in the park? What sort of situation would actually occur at a park full of kids that requires the use of a gun anyway? Sure, a couple teenagers or adults might get in a disagreement and maybe get into a fist fight, but the whole purpose of the security guard is to be large enough to break up the fight and then call the police so that they can deal with it legally. If somebody did sneak a weapon into the park, would one man with one handgun be ample protection for an entire park that can accommodate 2,000 people? We got the feeling that they were stretching to justify the gun to make everybody feel protected. I’m sorry, but our entire family didn’t necessarily feel as though we were protected because one security guard carries a gun. Although we enjoyed the day and the experience, I doubt that we will be back due to the moral issue we have with a gun in a family-oriented establishment, which really is a shame. It was a really fun place though, so if you don’t mind the armed security guard, then I would recommend it. 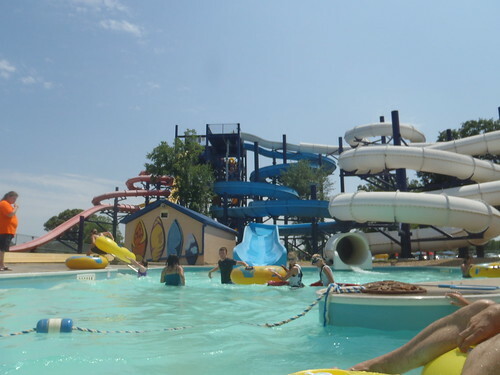 If you are interested in visiting the Splash Kingdom Waterpark, you can find them online at www.SplashKingdomWaterPark.com and buy your tickets online. However, I noticed that when I went to their ticket page that their security certificate was expired, so Google Chrome didn’t want to open it. 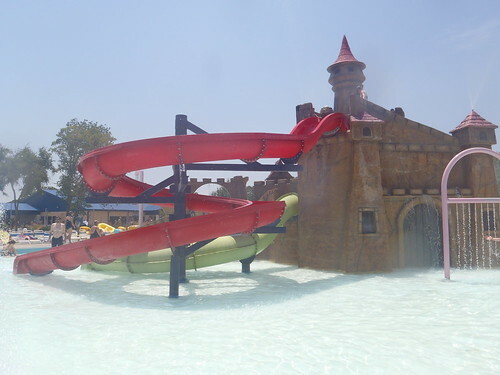 There is also another Splash Kingdom in Shreveport, LA, which is about two and a half hours from Canton.